On Saturday I headed down to Osceola County to Joe Overstreet Road, where Whooping Cranes have been eBird-ed regularly in the past few weeks. I’ve never seen a Whooping Crane in the wild before. My parents got me a book and video about Sandhill Cranes and Whooping Cranes for Christmas, and as I’ve learned more about these majestic birds I got a real itch to see a wild Whooper. It’s so sad how there are so few left in the wild. Then again, the population of Whooping Cranes was down to about 20 birds in the early 1900s, so a population in the multiple hundreds isn’t so bad, I guess. 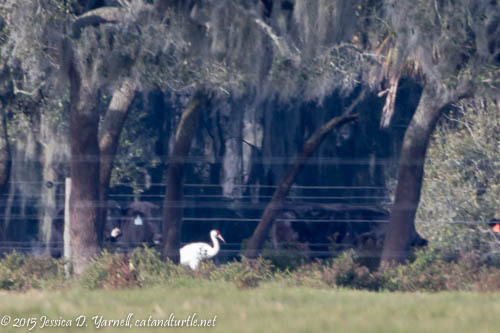 Well, I found my Whooping Crane, and this joins many many other bad photos of lifer birds. The crane was hanging out at a ranch just north of Joe Overstreet Road. 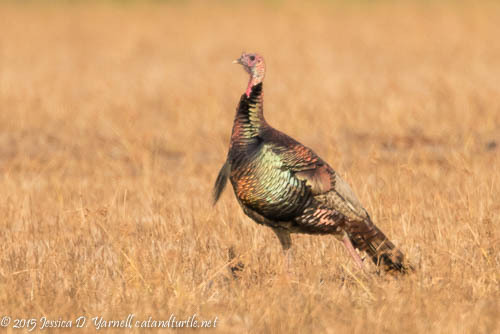 He was so far away that I could barely make him out, even with a 1600mm focal length (7DII + 500mm + 2x). But his feathers are definitely white and his face definitely that of a Whooping Crane, not a Sandhill. Now I just have incentive to go back to try for a better shot! 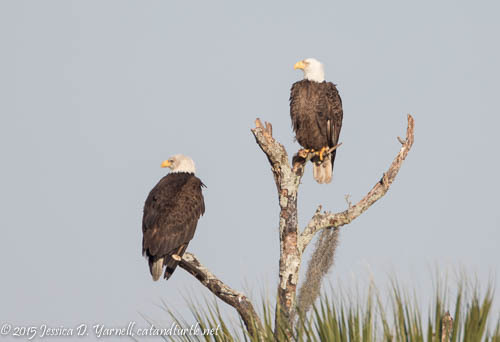 A pair of Bald Eagles was perched in a far-off tree. They stood preening and calling for the longest time. I sat and watched for at least five minutes before I got decent head angles from both of them. 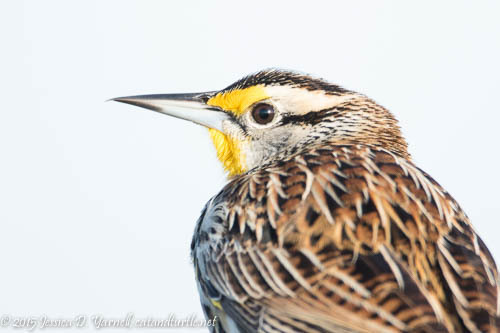 Eastern Meadowlarks were all over the place. A few hopped up onto the fenceposts that line the road. 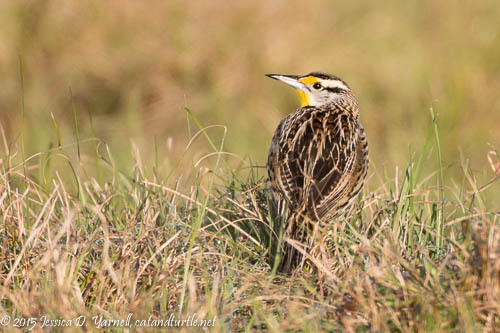 My favorite shots were of the birds in their native grasses. Sometimes they would climb up onto a small slope and pose. Then one hopped up onto a fencepost right next to me. 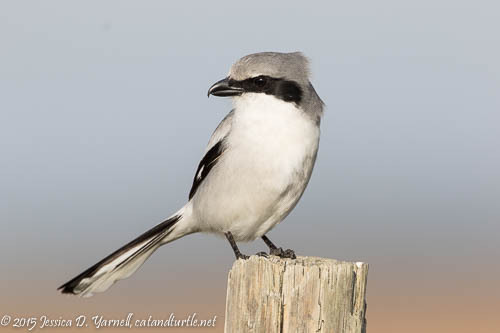 With the 2x still on my 500mm, I was all ready for a head shot! 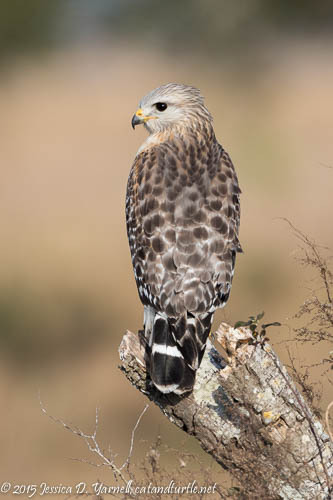 My favorite shot of the day was a Red-Shouldered Hawk that was perched on a dead snag some way away from the road. The light on him was perfect. A great last shot for a fun morning! Lucky you! I know well the pain of trying to photograph that whooping crane from years past. I usually get the heat waves interfering with the image. Sounds like you had a great day! Sounds like you had a great day! I still haven’t seen a whopper. Thanks you guys! We’ll have to try again together sometime. or maybe Roberta will give us her luck and send a Whooping Crane right up to greet us. Wouldn’t that be cool! ?